The only surviving evidence of the prehistoric shark Helicoprion is a tight, curled-up coil of triangular teeth, a bit like a fruit roll-up, but considerably deadlier. As far as paleontologists can tell, this bizarre structure was attached to the bottom part of Helicoprion's jaw, but exactly how it was used, and on what prey, remains a mystery. Some experts think the coil was used to grind away the shells of swallowed mollusks, while others (perhaps influenced by the movie Alien) think Helicoprion unfurled the coil explosively like a whip, spearing any unfortunate creatures in its path. Whatever the case, the existence of this coil is proof that the natural world can be stranger than (or at least as strange as) fiction! A recent fossil analysis, conducted with the aid of a high-resolution CT scanner, appears to have solved the Helicoprion enigma. Apparently, this creature's whirled teeth were actually housed inside the bone of its lower jaw; the new teeth gradually "unfurled" into Helicoprion's mouth and pushed the older ones further away (indicating either that Helicoprion replaced its teeth unusually rapidly, or that it subsisted on soft-bodied prey like squids). In addition, when Helicoprion closed its mouth, its distinctive tooth whorl pushed food further into the back of its throat. In this same article, the authors argue that Helicoprion was not, in fact, a shark, but a prehistoric relative of the cartilaginous fish known as "ratfish." Part of what makes Helicoprion such an exotic creature is when it lived: all the way from the early Permian period, about 290 million years ago, to the early Triassic, 40 million years later, at a time when sharks were only beginning to obtain a tentative toehold (or finhold) on the undersea food chain, competing as they did with comparably fierce marine reptiles. 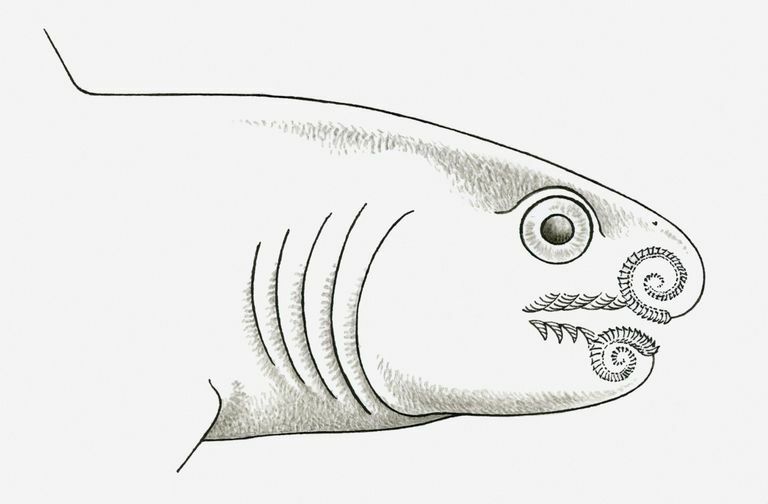 Amazingly, the early Triassic fossil specimens of Helicoprion indicate that this ancient shark somehow managed to survive the Permian-Triassic Extinction Event, which killed a whopping 95 percent of marine animals (though, to be fair, Helicoprion only managed to struggle on for a million years or so before succumbing to extinction itself).